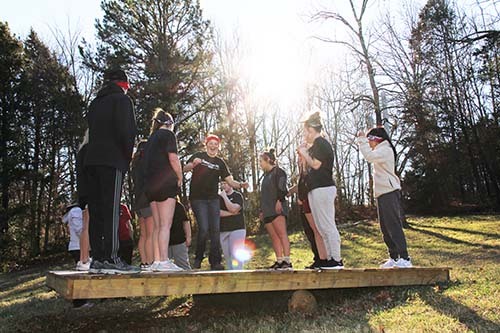 Incoming students to College of the Ozarks strategically place themselves on the wooden board in order to successfully balance each “family” member during the weeklong orientation, Character Camp. 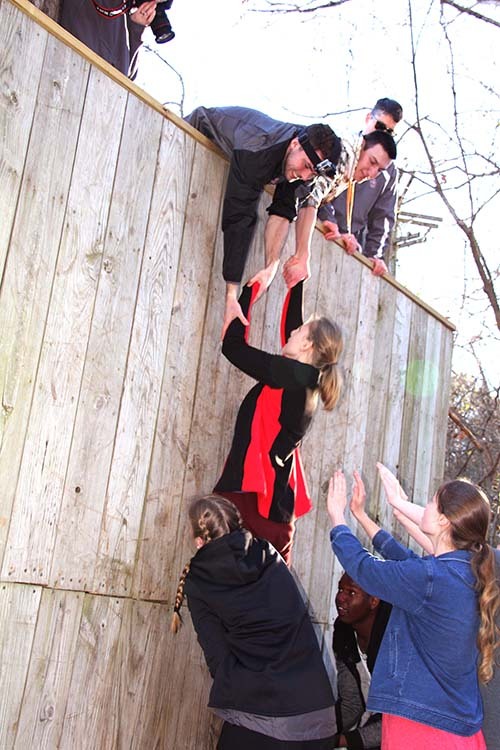 During the challenge course, College of the Ozark students demonstrate teamwork as they help one another up a wall, relying only on their strength and communication abilities. POINT LOOKOUT, MO. — New students at College of the Ozarks experienced a week-long orientation to launch the spring semester last week, Jan. 7-13. The event, called Character Camp, featured times of service and fellowship. Character Camp provides an intensive orientation to the College and clearly outlines what is expected of students. The program is also designed to develop character in students. During the week, 172 incoming students were assigned to one of 16 groups, called “families.” Each family was led by two upperclassman who model the character expected of a C of O student. These “moms and pops” served as leaders and mentors to the “kids” in their families throughout the week. Character Camp also includes participation in a challenge course, presentations by administrators and alumni, chapel services, and “family” time. Each incoming student wrote a “Reflections of Christ-like Character” essay. The essay is a requirement for students and is evaluated by various members of the College. Essays are judged on relevance, clarity, depth, and accuracy. Throughout this coming semester, the “families” will reunite three different times to discuss progress, and the “moms and pops” will encourage the incoming students by walking alongside of them in this new chapter of life. One of these “family” reunions will involve a community service project. On the last day of Character Camp, all the families gather for a special meal called the Honors Induction Etiquette Banquet. The banquet concludes the Character Camp week and is a way to celebrate the start of the semester. “It is also an opportunity for the ‘families’ to enjoy a culminating event that honors them and welcomes them to the College,” said Dr. Sue Head, vice president for cultural affairs and dean of character education.